The Lexicon PCM 41 is a versatile Digital Delay Processor, a compact third generation system that yields up to 800 milliseconds of high performance audio delay. It includes a host of special features, not found in simple delay lines, features that enable the performing musician to readily obtain pleasing and unique special effects. The Lexicon PCM 41’s superior sonic quality, rack mountability, and flexibility also make it an excellent choice for critical studio work. In order to obtain the best possible sound, Lexicon engineers rejected analog delay (BBD’s), Delta Modulation, and other quasi-digital techniques. Instead, the audibly superior performance of the Lexicon PCM 41 is attributable to the use of true Pulse Code Modulation (PCM), a signal encoding technique widely preferred by professionals. Thanks to our broad experience as a pioneer in the digital delay field, Lexicon engineers have been able to employ cost effective techniques while improving performance. As a result, the Lexicon PCM 41 out performs even the more expensive competitive models. You will hear extra clarity and presence because the Lexicon PCM 41 has a full 16 kHz bandwidth, and the absence of audible noise or distortion is sure to please the most discriminating users. 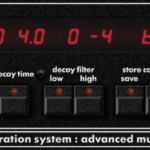 Engineering and musically oriented users alike will appreciate the ease with which the Lexicon PCM 41 interfaces to a wide variety of sound equipment; an adjustable input level control plus a 20 dB gain switch, a headroom display, and an output level control make it easy to obtain optimum results when patching into low or high line level circuits. Equally important, Lexicon has paid close attention to the human interface. As you familiarise yourself with the Lexicon PCM 41, you’ll appreciate how the controls are logically divided into clearly labelled functional groups: lNPUT, DELAY and VCO. Those controls affecting interaction of groups are arranged to imply their function. To assist the busy performer in quickly establishing the desired effect, we have differentiated the various controls by means of both colour and shape.